Medhat lists a number of examples in fields like utilities, vehicles, smart cities to support his thesis, which is essentially that you need to focus on the value aspect of DAM rather than the ‘digital’ element of how assets might be delivered or represented. This is one of a (very) select number of articles I have read about DAM that understands the true nature and depth of our subject. I have to say, the context the item appears in does Medhat no favours as most of the other pieces in the CIO Review ‘Media & Etnertainment’ special are the usual DAM vendor sales-spiel that you can read on the websites of the firms concerned (note to CIO Review also: the 1990s-style blocking the use of the browser ‘copy’ feature on your site merely frustrates those who want to legitimately cite your articles, it won’t stop your material from getting ripped off). 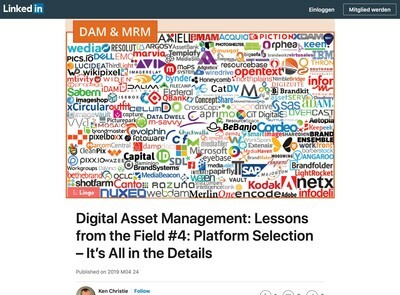 His piece, however, has hit the nail on the head when it comes to understanding what Digital Asset Management is all about. 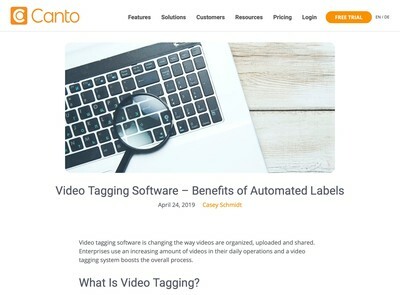 The significant point with this item (and our whole discussion of DAM value chains) is that digital assets are assemblies of metadata, which can appreciate in value and sophistication the more connected you make them – which also means they can be applied to a limitless range of uses. Those involved in the DAM market should read through this article and understand the commercial implications. There is a undeniably a lot of hype about IoT but the potential revenue opportunity and wider changes it will usher in seems like it will be very significant, just based on a superficial examination of how many different aspects of everyone’s lives this technology is likely to touch. Digital assets are an ideal conceptual model for representing IoT data (amongst others – as noted by Medhat) and it should be a source of great encouragement for those involved in DAM to see them being adopted in the manner discussed in this article. 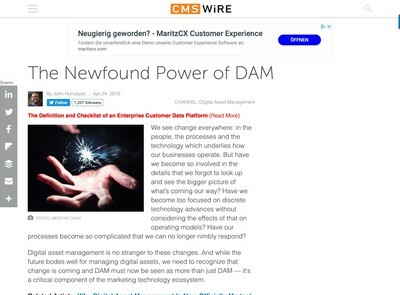 In addition to this one, I recommend re-reading Lisa Grimm’s piece last year, DAM Expands Its Reach in the Enterprise, which I also discussed at some length. For anyone considering writing an article for our Improving DAM series, Medhat’s article might provide a useful source of inspiration for some more unique angles on the subject that others may not have thought of. When it comes to getting to grips with genuine DAM innovation, this is definitely more like it. I agree that “dynamic assets” sound interesting. But what confuses me is that Medhat Mahmoud calls all kinds of IoT sensor data “digital assets”. The arrival of new technologies doesn’t automatically change a definition – it’s up to us to clarify or redefine. According to the DAM Glossary, DAM deals with “computer files (or digital assets)”. Sensor data matches this definition, I guess. But to me, a better definition of DAM would refer to “creative content” instead: Photos, videos, texts, presentations; products of human creativity. I don’t think that’s just my personal opinion – this is what current (and past) DAM systems were built and optimized for. Arbitrary, machine-generated data is often valuable (you could call it a “digital asset”) but there’s all kind of database and analytics software for it already. I think you cannot have data structures, workflows and user interfaces work equally well for both creative content and “big data”. They are essentially different things. I tend to agree with Medhat on this one. In my mind, digital assets are composed of some data of intrinsic value, the context and use of which is defined by metadata (extrinsic value). In other words, digital assets are self-contained packages (or ‘objects’ to use software terminology). I saw the Toby Martin article and I agree with this up to a point, but I don’t think the definition of DAM has really changed, more that people’s understanding of what digital assets are has evolved and they are starting to realise it is possible to abstract them for other purposes than just ‘creative’ content. While I agree that DAM isn’t the same as Big Data, I don’t agree that it is restricted to creative assets. I think this is contributory to why DAM has not achieved it’s true potential so far because it’s too easy to dismiss it as ‘just a photo library’ (etc). 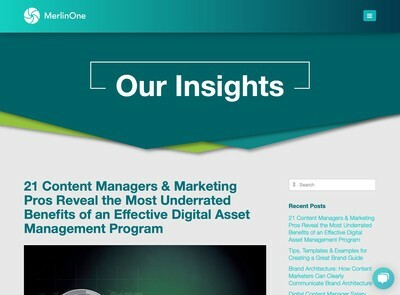 To put it simply: digital creative content is a type of digital asset, but it does not define what digital assets are. More or less anything where you can self-contain data as independent entities that are defined and contextualised by metadata can be a digital asset. This is why the digital asset concept is very powerful and why it has application in IoT (amongst other fields). Toby is right about that (as is Medhat). It’s important to note we’re talking about conceptual models here, not technological implementation. The latter is important, but the former is what will be the basis of a strategy (or ‘design’ if you prefer) and it will last for a lot longer because changing that aspect is so expensive and disruptive (in the conventional or pejorative sense of the word) for most organisations to do very often. On the DAM Glossary definition, it’s probably out of date. I wrote this about 10 years ago and no one has proposed an amendment to it. In fact, hardly anyone apart from Ian Matzen (and one or two others to a lesser extent) has contributed very much to DG at all. About 80% of the content is identical to the state it was when it was made a public project a few years ago (and it hasn’t changed much for 4-5 years before that). It’s another one of these situations in DAM where there are a lot of public protestations about the state of the world followed by virtually no action when people get asked to do some actual work. Anyhow, that’s another issue for another day.